©ESI Photography. Aaron Vale traded the lead with Tracy Fenney several times during today’s $25,000 SmartPak Grand Prix. OCALA, FL (January 17, 2013) – The first grand prix of the season at HITS Ocala took place this afternoon as Aaron Vale of Morriston, FL and Flower Mound, TX’s Tracy Fenney put on quite a show during the $25,000 SmartPak Grand Prix, presented by Pfizer Animal Health. It was Vale who piloted Amen Corner Farm, LLC’s Palm Sunday to the winner’s circle for their first victory of the season. Vale, a native of Dallas, Texas, committed SmartPak user and HITS Ocala regular, showed three horses in today’s class and made it to the 14-horse jump-off with all of them. It was Palm Sunday, however, who was able to execute a tricky inside turn to the second fence in the jump-off, a skinny vertical next to the water. “There were plenty of distractions and reasons why that turn wasn’t attractive, but if we had any chance of beating Tracy, that was going to be where it would happen,” said Vale. And happen it did as Vale posted the winning time of 36.18 seconds. Fenney and MTM Farm’s MTM Timon were just fractions behind, but settled for second in 36.66 seconds. Vale picked up third with Thinkslikeahorse’s Kryptonite, as well as fifth aboard Campos & Miranda Investment’s Spirit of Lena. Fenney was fourth with MTM Farm’s MTM Centano. Jack Robson of Coronado, CA built a 12-obstacle course with 15 jumping efforts, including a triple combination at fence eight and a double at 11. The course presented a fair challenge to 25 pairs and welcomed 14 back for a six-fence jump-off, which included the B and C elements of the first round triple. Vale was pleased the Palm Sunday’s performance and looks forward to showing him in more grand prix throughout the circuit. The 13-year-old gelding came to Vale last April and has been successfully moving up the ranks, adding a couple of grand prix wins to his resume at the end of last year. “I hope to keep him fresh and healthy with an eye on the $100,000 [Sullivan GMC Truck Grand Prix, presented by Great American Insurance Group] class at the end of the season,” concluded Vale. ©ESI Photography. Jonathon Millar and Cantero Z got competition started on Wednesday by riding to a win in the $2,500 Brook Ledge Open Welcome. Competition got started in the Grand Prix Field on Wednesday with the first $2,500 Brook Ledge Open Welcome of the season. The leaders in commercial horse transportation, Brook Ledge welcomed a field of 19 to get things started. 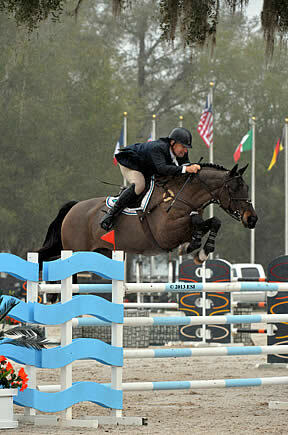 It was Jonathon Millar of Perth, Ontario who rode Iron Horse Farm’s Cantero Z to the blue and a $750 winner’s check. Jordan Coyne of New Port Richey, FL did her best to chase down Millar with her own Cordova, but ultimately settled for second. 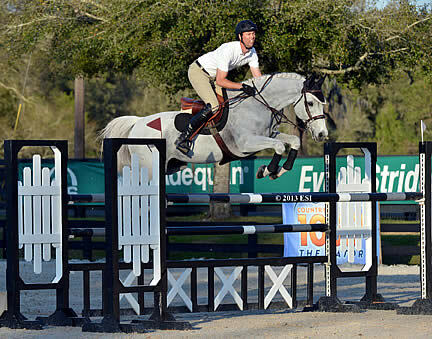 Fellow Legacy Farm rider, Jared Petersen of Archer, FL, piloted Derek Petersen’s Titus 2:11 to third behind Coyne. Vale warmed up for today’s three top five grand prix finishes in the Brook Ledge Open Welcome with a fourth-place finish in the irons of Spirit of Alena. Brandie Holloway of Topeka, KS capped the top five with Hays Investment Corp.’s Yolo. Making its return to the HITS Schedule this year will be the $50,000 East vs. West Hunter Challenge. Last seen in 2001, the class will pit the top 12 riders on the East Coast against the top 12 riders on the West Coast for a simulcast battle. Two sets of judges – one in Ocala and one at the HITS Desert Horse Park in Thermal, CA – will evaluate horse and rider and determine one winner. The class will be simulcast in both locations and will also present an opportunity for spectators to choose an audience favorite. Making its debut at HITS Ocala will be Take2 – a program founded by the New York Thoroughbred Horseman’s Association (NYTHA) and the New York Racing Association (NYRA) designed to promote the value of the Thoroughbred in the sport horse world and to highlight the success of Thoroughbreds as show horses. HITS Ocala weeks V, VII and IX are recognized by the Take2 program. Yesterday’s competition kicked off nine weeks of horse showing at HITS Post Time Farm and 2013 promises to be a season to remember. Each week offers qualifying opportunities for September’s HITS Championship Weekend in Saugerties, NY and entices riders to take a chance on over $1.75 million dollars in prize money, including the $250,000 Hunter Prix Final, Diamond Mills $500,000 Hunter Prix Final and Pfizer $1 Million Grand Prix. Between the HITS Hunter Prix, Devoucoux Hunter Prix and two grand prix each week, including the coveted $100,000 Sullivan GMC Truck Grand Prix, presented by Great American Insurance Group, HITS Ocala is the place to be for winter qualifying.